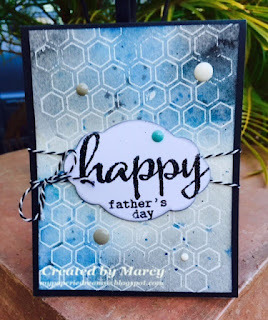 Loves Rubberstamps Blog: Happy Father's Day! Hello Friends! Hope you're all having a wonderful weekend! In preparation of the Father's Day Holiday coming up, I thought I'd create a Father's Day card for my share today! I had so much fun water coloring with my distress markers for the last card that I couldn't resist making another card with a water colored background! For this one, I used a background stamp I have in my stash and stamped it onto some Tim Holtz water color paper using my Versamark Watermark Stamp Pad. I then added some white embossing powder from Recollections and heat set it. 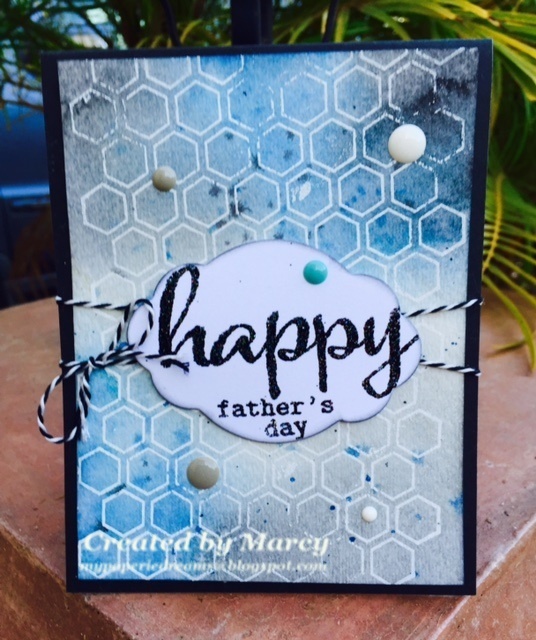 Over this cool design, I water colored over it with my distress inks and water using some colors I thought would make a good background for a masculine card. The colors I used were Pumice Stone, Faded Jeans and Black Soot. I really love the way they blended together so well! I added some splattered ink to parts of it for a fun effect! The sentiment came from a Winnie & Walter Set called "The Big, the Bold & You". I also embossed this sentiment and used some Sparkle Black Ranger embossing powder for this. The die cut used for the background is from MFT called Warm Wishes Die-Namics. To finish off my card, I added some enamel dots and twine. For those of you celebrating Father's Day, I hope the "Dads" in your family have a special day and that you all have a wonderful celebration!